This past October brought students from Denmark to visit the College for the fourth consecutive year (and fifth time, overall). Seventeen Danish students and two instructors helped internationalize our campus by attending classes at FDTC and competing once again for our entrepreneurship award. 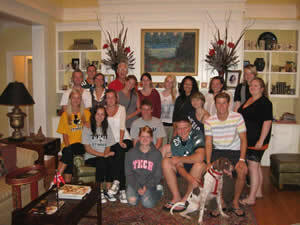 Tuffy Edwards led the sessions where the Danish students worked alongside Tech students to develop a business plan. The Danish students also visited a number of local businesses including: General Electric, Honda, Nucor Steel, and Carolinas Hospital. In addition, they also took trips to Columbia (the State Capitol, USC's Darla Moore School of Business, and the Riverbanks Zoo), Charleston, and Myrtle Beach. These students help enrich our campus by providing our students with different viewpoints about the importance of recycling, government's role with respect to taxation, and (in general) a greater emphasis on society as opposed to individual consumption. 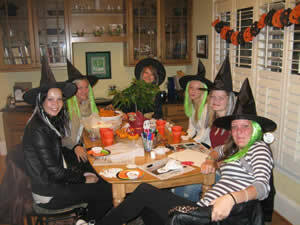 As you can see from the pictures, the students also enjoyed carving pumpkins and celebrating Halloween at Mitch's house. This fall, Steven Weingartner also explained the impact of the "Euro Crisis" on our election to his International Business class. The use of a common currency has made it easier for Germany to export their goods throughout Europe, while at the same time, highlighting the weakness of many European economies (Greece, Italy, Spain, and now potentially France). Each of these countries has had to deal with the problem of increased debt to the point where there have been separate runs on these countries respective bond markets. The higher the bond yields caused by financial panic, the more expensive a government's debt becomes. The relation of this to the United States is that there is a tremendous amount of foreign investment by US businesses in Europe. Despite healthy profits by US businesses, unemployment here has remained relatively high (around 8%). The uncertainty with how the Europeans would deal with their "Euro Crisis" had a lot to do with the failure of US businesses to use some of their profits to expand (add jobs). When the European Central Bank (ECB) stepped in (with the support of Germany) to prevent further runs on the bond markets of these countries, the US economy experienced increased stability and unemployment stabilized. While South Carolina voted for the Republican Candidate (Romney), the relief that the US economy experienced as a result of the ECB's actions helped the Democratic candidate (Obama). And while many people are talking about a variety of other issues to explain the election's outcome, the economy has always been a focal point during elections. From our department to you and yours, we wish you a great 2013 and thank all of you for the support of our programs. Many faculty outside of our department contributed to the "International Experience" by hosting our Danish guests in their classes.